giving residents a new way to connect with their city. 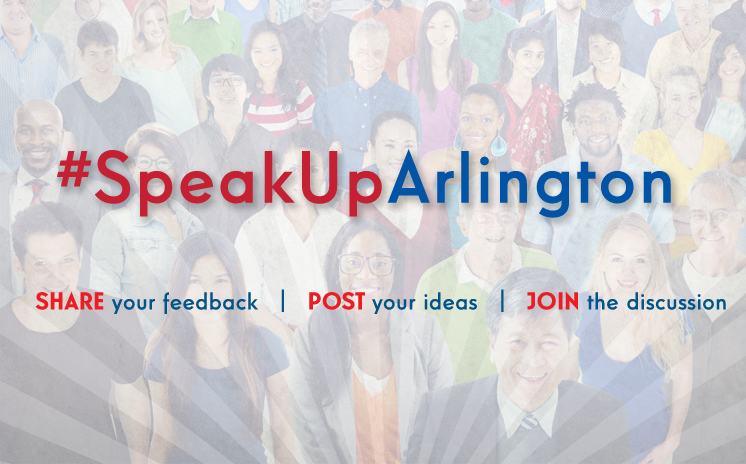 The Speak Up Arlington site, which launches Tuesday, December 9, will allow residents to ask questions, post suggestions and receive feedback from city staff. Plus the city will be able to get community feedback through discussions and surveys on its various projects and initiatives. said Arlington Manager of Marketing and Communications Jay Warren. As a city government, not only do we get to see what residents are thinking, but it also gives us a chance to prioritize the feedback, as we work to make Arlington: the American Dream City an even better community. Initially, people will be able to engage in an online conversation about two major community initiatives  the new Central Library and the Citys neighborhood program, which helps build stronger relationships between the city and its neighborhoods. Heres how it works: first, visit www.SpeakUpArlington.com and sign up for an account either with your email or by connecting with Facebook. Next, post your comment or read feedback from other citizens. When residents register, they will be asked for an address. According to Warren, this is so if there are neighborhood-specific projects, the city can target that neighborhood instead of the whole city. For more information about Arlingtons Speak Up Arlington website, contact Reginald Lewis, communications coordinator for the City of Arlington at 817-459-6405.